"After last year's event, a tourist couple came up to a group of us and said they had left the lights on in their rental car and the battery was dead. I got cables and started walking to their car with them. Along the way, I mentioned that one of the men they'd been talking to was Alan Arakawa, who was then the mayor of Maui County. "The husband stopped, jaw agape; he couldn't believe it. I assured him it was so, and he remarked that the mayor seemed 'so normal, like a regular guy.' We barely got up to his car when a Hana resident who was passing by pulled up in his pickup to jump the car. "The man and his wife were surprised at the sequence of events; they assumed they were going to have to call the car rental agency to help them. Haiku came through for them; I was happy we were given the chance to show our neighborliness. They said they were coming back to Maui this year, and I expect to see them at the festival again." Gagne paused, then smiled broadly. "If you want to see aloha in action, you'll find it at our festival." Now in its 13th year, the Haiku Hoolaulea and Flower Festival has raised more than $30,000 annually for Haiku Elementary School to purchase equipment and supplies, and to enhance its art, dance movement and other programs. It's the result of countless hours of coordination and work by teachers, residents, business owners, their families and friends who band together for this worthy cause. In 1992, when Gagne was president of the Haiku Community Association, the unifying components of the community were the school and the post office. "Haiku was a rural part of Maui back then, and residents used to meet at PTA meetings or whenever we dropped off or picked up our kids at school," he recalled. "We have extensive home mail delivery today, but we didn't back then. We got to know our neighbors when we picked up mail at our P.O. boxes." The Haiku Hoolaulea and Flower Festival started to highlight the area's flower growers as well as raise funds for Haiku Elementary School. At the time, Haiku's flower industry was experiencing phenomenal growth, and HAC leader Ed Silverstein suggested that the association launch a flower festival to support the school, encourage fellowship and promote the blossoming industry. HAC members formed a planning committee, although none of them had any experience organizing such an event. "We had to invent all the logistical procedures, dream up activities, recruit help and convince businesses it was going to happen with no track record to prove it," Gagne said. "Each small success led to something else that had to be done, but six months later nearly all the pieces were in place." Highlights of the inaugural event in June 1994 included the Haiku Rubber Boot Race, which required competitors to slog over Haiku's wet soil wearing rubber boots. "You gotta love rain if you live in Haiku," Gagne said, smiling. A young fellow pushing a manual Toro mower won the Lawn Mower Race bested 15 other entrants riding power mowers. "The whole event came off very well," said Gagne, "and with the help of grants from the County of Maui and Alexander & Baldwin, we made almost $700." SADLY, Silverstein died three months later. "We were all stunned by his passing, and it made us vow to carry on," Gagne said. 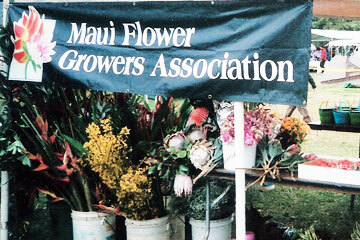 Over the years, the Haiku Hoolaulea and Flower Festival grew dramatically in terms of volunteers, activities, attendees and amount of money raised. Today, as Haiku Elementary's primary fundraiser, it welcomes 5,000 people for a day of family fun. There are lei-making and flower-arranging contests, a climbing wall for kids and homespun games such as Golfasaurus -- a miniature golf course with large dinosaurs as the background scenery. Nonstop entertainment includes Hawaiian music, hula, reggae, rock 'n' roll and a band of talented ukulele players. Participants can visit 20 information booths sponsored by organizations such as the Sierra Club, state Department of Agriculture, Maui Coastal Land Trust, Friends of Haleakala National Park, Maui Family Support Services and Maui County Recycling Program. Fifty vendors sell jewelry, clothing, woodcarvings, seed leis, soaps, lotions and other locally made wares. Fresh fruits, vegetables, plants and flowers -- both cut and arranged in beautiful bouquets -- draw crowds to the farmers' market. Food booths offer fish tacos, salads, burgers, plate lunches and a host of other ono (delicious) fare, and there's no better way to conclude a hearty lunch than with something sweet from the bake sale, with most of the items homemade. An eclectic array of silent auction available ranges from fine art, framed photos and antiques to tools, cases of motor oil, and restaurant and hotel certificates. PINEAPPLE HAS BEEN farmed in Haiku for nearly 90 years. While houses have sprouted up in its place in many areas, some 150 acres are still committed to the crop. Longtime Haiku Elementary teacher Michael Suda conducts tours of significant sites, including former cannery locations that now are shopping and light industrial districts. Two years ago, residents launched the Haiku Living Legacy Project to document the area's history. A nostalgic display from the old plantation days includes toys, coins, yearbooks, historic pictures of Haiku School and pineapple-processing mills, and snapshots from family albums. Festival-goers also can view "talk story" sessions with dozens of Haiku kupuna (elders) that have been conducted as part of the Haiku Living Legacy Project. According to Gagne, a search currently is under way for a permanent home for the memorabilia, photos and videotaped interviews that have been collected for the project. In 2005, Haiku Elementary held its centennial observance in conjunction with the festival. Graduates came from all over the state and the mainland to join in the celebration, which ended with a catered dinner for a thousand guests. "People who hadn't seen each other in 40 years were so happy and excited to reconnect," said Gagne. "Those of us who weren't graduates laughed and cried right along with them. That event bonded our community in a way we hadn't experienced before." According to Gagne, more exciting things lie ahead for the Haiku Hoolaulea and Flower Festival. "So many people are getting involved that it keeps getting better and better," he said. "The sky's the limit when a community pulls together to accomplish something like this, and everyone, even visitors, feels like they're a part of it."